Synopsis: Picking up where the first film left off, The Raid 2 follows Rama as he goes undercover and infiltrates the ranks of a ruthless Jakarta crime syndicate in order to protect his family and expose the corruption in his own police force. A few years ago, Welsh-Born Indonesia-Based filmmaker Gareth Evans captivated audiences with The Raid: Redemption, a fun martial arts-siege movie combo that left an impression on everyone who saw it. When a film has that kind of impact, a sequel is inevitable. Lucky for fans, Gareth Evans made that, too. The Raid 2 is here. The Raid 2 brings back Iko Uwais as Rama, the policeman who fought his way through The Raid: Redemption. This time, he is tasked with going deep undercover within the Bangun family, an Indonesian crime syndicate that has corrupted certain officers in Rama’s own police force. Infiltrating the family is not easy, as it requires Rama to spend years in jail in order to meet and earn the trust of fellow inmate Uco (Arifin Putra from Macabre), the son of Bangun (Java Heat‘s Tio Pakusadewo). Upon his release from prison, Bangun and Uco take Rama into the family, where he is entrusted as a street soldier. As he works his way up through the ranks of the organization, Rama uncovers more and more of the family’s dealings…and a bit of internal scandal. Rama risks life and limb to complete his mission while keeping his true identity a secret from the crime bosses. Gareth Evans figured out the formula with The Raid: Redemption, and sticks with it in The Raid 2. Just like its predecessor, the sequel is a reliable plot that serves as an excuse for a whole bunch of fighting. 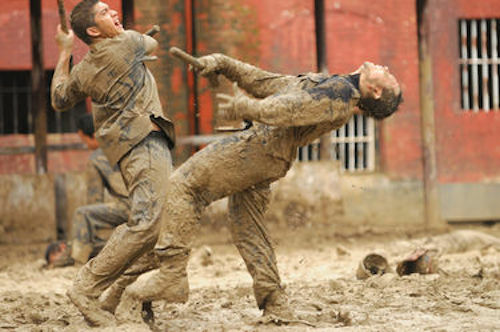 The Raid 2 is done on a much grander scope than the first film, with more locations and a wider variety of characters. Whereas The Raid: Redemption was very much a siege/invasion movie, The Raid 2 is a modern kung-fu quest film, drawing influence from other contemporary classics like Chan-wook Park’s Oldboy and Quentin Tarantino’s Kill Bill films. It’s a fun progression; Gareth Evans didn’t try to fix what wasn’t broken, he just added to it, supercharging it in the process. 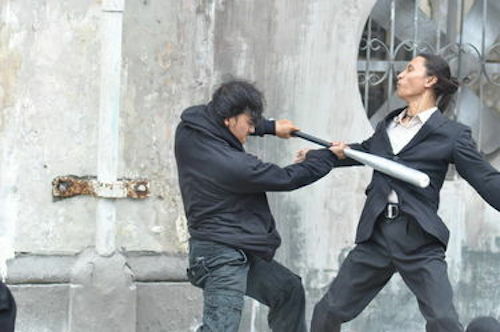 One of the obvious Tarantino influences in The Raid 2 is the introduction of more colorful characters, particularly a fun pair named (creatively) Hammer Girl (Julie Estelle from Brokenhearts) and Baseball Bat Man (Very Tri Yulisman, who played a bit part in The Raid: Redemption). Hammer Girl is a deaf girl whose weapon of choice is, in a possible tribute to Oldboy, a pair of claw hammers. Baseball Bat Man is her brother, tasked with caring for her and, obviously, using a baseball bat and ball to fight. These are the type of unique characters that were missing from The Raid: Redemption, and they give Rama a pair of formidable antagonists with which to tangle. The pair also insert a bit of dark, Freddy Krueger-like humor into their scenes. For example, Baseball Bat Man will hit a ball towards his enemy, smashing it against the wall behind them. He will then ask for it back, like a kid in a playground would request the return of a foul ball. It doesn’t exactly humanize the villain, but it makes the audience release a little tension with a chuckle before the next breathtaking round of fighting. As far as story goes, there’s not much to The Raid 2. That’s okay. Actually, it’s more than okay. Gareth Evans lets Iko Uwais and the rest of the cast do what they do best: fight. The film is shot with such energy and adrenaline that it’s impossible to watch and not root for Rama. The Raid 2 is not for everyone, but those who wouldn’t enjoy it probably wouldn’t end up at the theater in the first place. Those who would enjoy it already know it, and they’ll get to have all the fun. The action sequences are what really drive The Raid 2, and they are frighteningly well done. Every fight scene is meticulously planned out and highly choreographed, and there are a ton of great fight scenes. Photographically, Evans draws on films like Oldboy for inspiration, building up to fights with short cuts and tight close-ups to generate suspense, then switching to long takes and wide angles that let the action unfold as if the viewer were a participant. For example, in one scene Rama fights a couple dozen inmates in a prison bathroom. Rama is locked in a stall while the other men pound on the door. Evans shows the slide lock, screws straining against the pressure, for what seems like forever, until the door breaks, and Rama systematically fights his way through his attackers. In another scene, Rama is caught in a prison riot on a rainy day, and the camera is right there in the mud and blood with him and those who have the misfortune of battling him. The fights are shown with minimal edits with the footage sped up just a hair, emphasizing and exaggerating the flawless stunt work. The action is not limited to man-on-man combat, either; there’s a pretty cool car chase in the film as well, one of the benefits of the varied locations of The Raid 2. Overall, one would be hard pressed to find better action sequences than those in The Raid 2, and there aren’t even any Michael Bay-sized explosions – just a lot of punching and kicking.